After finally earning enough jewels to hire a third imp, I booted up Dungeon Keeper (Free) and found the price had gone up by a good measure. Welcome to the dungeon, keeper. It has been determined that previous training exercises for prospective evil lords, released for computers, were 87% too satisfying and 100% too entertaining. Not to worry, however, as some of the underworld’s most diabolical minds have been working double overtime (unpaid, naturally) to ensure that keeper cadets will enjoy themselves as little as possible in the new mobile version of the simulator. Personally, I think they’ve outdone themselves. It’s been a very long time since gamers last saw the well-regarded Dungeon Keeper series. Dungeon Keeper 2 was released in 1999, but a planned second sequel ended up canceled and the IP went dormant, like many other PC-centered IPs owned by EA. 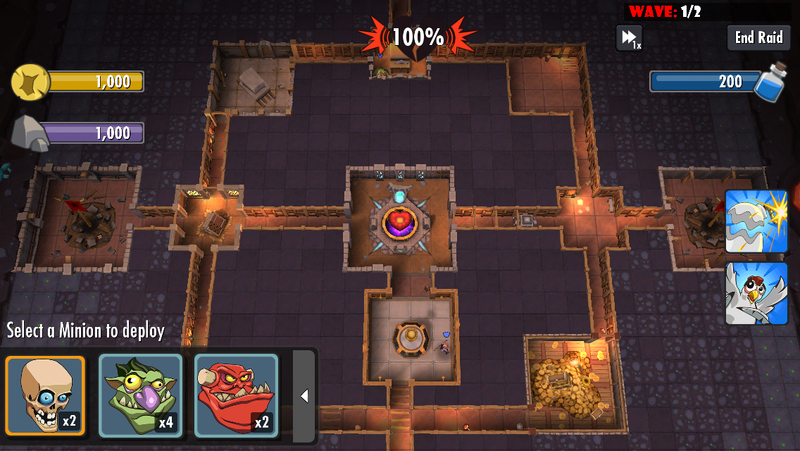 I suppose with the booming popularity of both castle/tower defense games and construction games on mobiles, EA saw a good opportunity to bring Dungeon Keeper back. This joins SimCity and Ultima as long-slumbering EA franchises that have made a recent return, and unfortunately, it’s got a lot of things in common with those revivals. 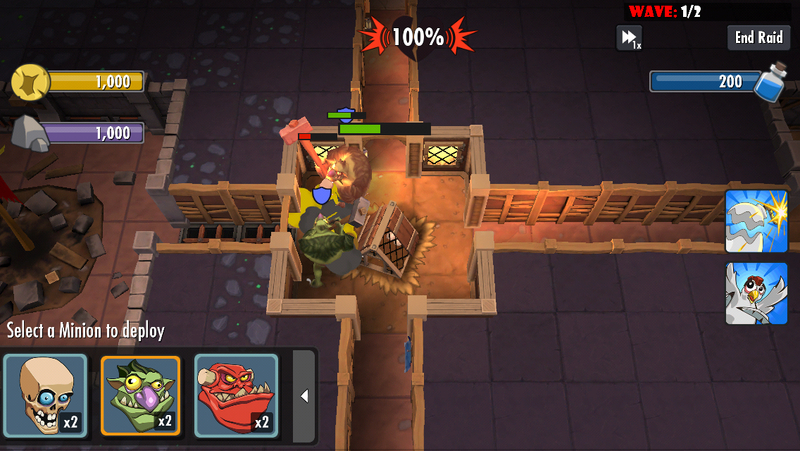 This new Dungeon Keeper game is a free-to-play game with very aggressive monetization elements, and though it retains some of the things that made the original games so enjoyable, it’s neither a very good Dungeon Keeper game nor a particularly good competitor to similar games like Clash of Clans (Free) or Game of War (Free). First of all, to the Dungeon Keeper fans out there: just walk away. This game isn’t doing any element of its design better than the original games did, and the new aspects are almost entirely negative and incredibly overbearing. The maps are smaller, the systems are less complex, and as a result, the strategy is considerably weaker. It’s a far worse game than its forefathers, and that’s not even going into the monetization techniques. It reminds me a lot of the recent SimCity revival in this respect, where even if you took away all of the issues external to the gameplay, the game itself is a poor successor. As in that case, you’re probably better off playing one of the older titles if you want to revisit your happy memories. A new installment in a series can lack appeal for the fanbase and still stand on its own as a decent game, however, so I’ve decided to base this review less on how this fails as a sequel and more on how it fits into the current iOS landscape. I’m not surprised at all that EA chose to take this game in a F2P direction. Much as it might not be what core gamers want, the big money on the platform is being made with games of this ilk. 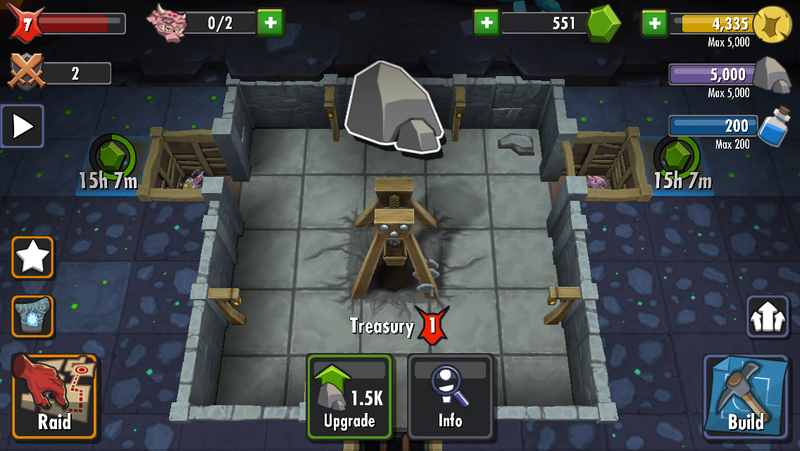 EA themselves have had a taste thanks to the highly successful Simpsons: Tapped Out (Free), and with Dungeon Keeper‘s broad design having so much in common with some of the most popular F2P games out there, it was a logical move. The problem is that this just isn’t a very good game, even in that narrow context. I’ve played a lot of those F2P simulation games, enough to say without a doubt that there are good ones and there are bad ones. Games like Clash of Clans don’t just take a top spot and sit there for months or years on pure luck. Rather, they’re pretty good at giving players just enough to do to fill in a few minutes in a way that still feels meaningful in some way. It might take you hours or even days to build something, but when it finishes, you’ve got a shiny new building to look at, with new abilities and options at your disposal. While it’s building, you’ve got lots of other things you can tend to. While your options are limited in the beginning, things move pretty quickly, so there’s almost always something to do. That’s how to pull off a good F2P construction game. If you want to pull off a bad one? Have the player tie up all of their building capabilities for 24 hours to dig out two blocks. In case you’re totally unfamiliar with Dungeon Keeper and can’t quite parse out what the name implies, in this game, you are the keeper of a dungeon. You have minions who you can put to work to build various structures, gather resources, lay traps, and create your dream dungeon. You can opt at any time to defend against enemy attacks and go on raids of your own. This might sound rote in 2014, but in the 1990s, it was a pretty fresh idea. In this iOS version, there are a few different things that will clog the pipes for you as you play. First off, you need to have the correct amount of resources to do most things. There are three resources, with one of them being a premium type that trickles out pretty slowly. The other two resources are capped by how many storage rooms you have, and that in turn is capped by the level of your dungeon heart. Everything you will want to do with regards to construction needs to be carried out by your imp servants. After playing through the tutorial, you will have two of these little fellows, meaning you can work on two things at a time. Hiring another imp requires a fair amount of the premium currency, but I can’t tell you how much it would be as you read this, because EA keeps changing (increasing) it. So, you’re probably stuck with two imps for a while, unless you dig into your real life gold reserves. You’ll need an imp on hand to do so much as even dig out a square of dirt. The dirt comes in different varieties, and you’ll almost instantly hit the dirt type that takes four hours to dig out per square. Awesome. It won’t take you long after that to hit the stuff that takes a full day to dig out. Once again, per square. It’s easy to tie up your imps just trying to dig a little hallway, and when you come back the next day, all you’ll have to show for it is a couple of empty squares. Not exactly satisfying. The paywalls come fast and hard in this game, that much is clear. However, even when things are moving smoothly, the game still can’t compete. The potential size of your dungeon is not very big, so there aren’t really that many interesting dungeon ideas you can build. Moreover, some poor balancing on almost everything means there are really only one or two optimal ways to build your dungeon. You will be punished if you attempt to get creative. It makes the game feel incredibly tiresome very quickly, even if you’re patient with timers. If you take away the fun of making weird dungeons, throw up timers longer than other games, and give less enjoyable results, what leg does this game really have left to stand on? Well, it’s funny, at least. The humor has survived intact from the older games, giving Dungeon Keeper that cheeky vibe that Bullfrog’s games were well-known for. The game even hangs a hat on its more questionable monetization tactics from time-to-time, with most of the comedic punch being delivered by H.R., the narrator. As in the old games, you can slap your imps around to make them work a bit harder, and unlike the old games, there are no ill consequences for doing it, so have it at. The game also looks and sounds pretty good, delivering the kind of presentation you would expect from a publisher like EA. One more thing I should mention is that EA has been adjusting things constantly since the game’s soft launch several months back, which would normally be a sign of hope. However, in this game’s case, most of the adjustments have worked towards making iteven more unfair and grindy. In the short period since the game’s official wide release, prices have gone up on a variety of things, even. I can’t imagine why they feel the need to turn the screws even harder on this one, they’re already incredibly tight. 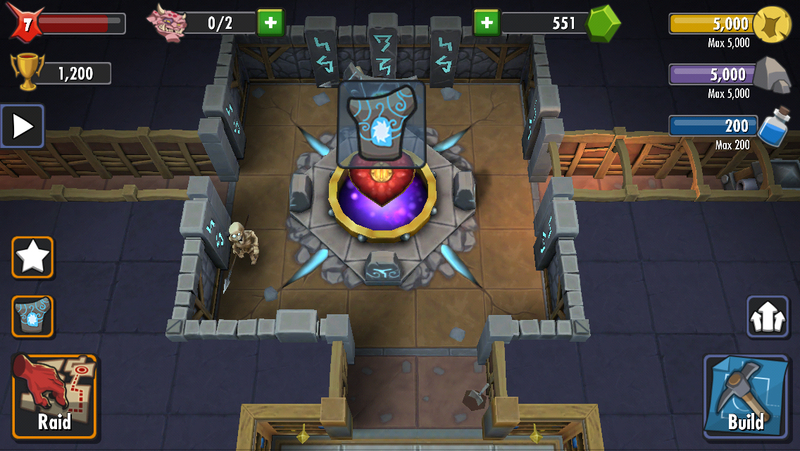 In the end, I can’t imagine Dungeon Keeper is going to satisfy anyone very much. If you loved the old games, you’re going to be pretty unhappy with how much the game’s been simplified and monetized, and if you just like a good F2P construction/war game, you’re going to find this one severely lacking in a variety of ways compared to the best and brightest in the genre. If you’re in the former camp, go check out Castle Doombad ($2.99), as it’s a great take on the genre in the same spirit. If you’re in the latter, stick with Clash of Clans. Apart from a dash of charm and wit, there’s little happiness to find in these dungeons, keeper.